Few days ago Disney has shared the video about Its Hair Shading System. Today, They show us the video about a method for consistent automatic transfer of edits applied to one image to many other images of the same object or scene. 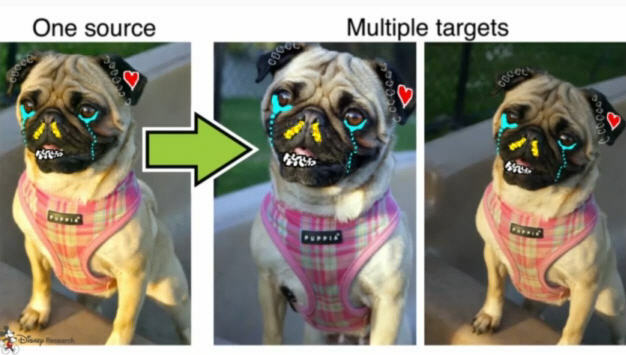 By introducing novel, content-adaptive weight functions we enhance the non-rigid alignment framework of Lucas-Kanade to robustly handle changes of viewpoint, illumination and non-rigid deformations of the subjects. Our weight functions are content-aware and possess high-order smoothness, enabling to deﬁne high-quality image warping with a low number of parameters using spatially-varying weighted combinations of afﬁne deformations. Optimizing the warp parameters leads to subpixel-accurate alignment while maintaining computation efﬁciency. Our method allows users to perform precise, localized edits such as simultaneous painting on multiple images in real-time, relieving them from tedious and repetitive manual reapplication to each individual image.